The main job of a FMCSA certified medical examiner during a DOT physical is to look for conditions that could prohibit a driver from safely operating a commercial vehicle. While the above conditions could make a driver ineligible to obtain a CDL, it is ultimately up to a certified medical examiner to decide. The only way to know if you will fail the DOT physical because of a preexisting condition is to consult with a healthcare professional. 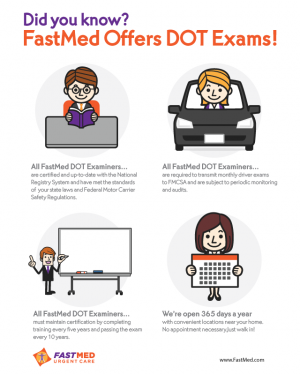 FastMed has a team of FMCSA certified professionals ready to meet with you day or night with no appointment required. When it comes to your DOT physical, there is no safer choice than FastMed Urgent Care.